Due to environmental awareness and shortage of timber, many countries such as the United States, Japan, Britain, Australia and others are actively promoting the application and development of low-rise light steel structure warehouse building. As early as the 1960s, the concept of "rapid installation of prefabricated houses" was put forward. However, due to the immature market, the concept has not been well developed. By 1987, the appearance of high-strength cold-formed thin-walled steel structures appeared in Australia and New Zealand's joint specification AS / NZS4600 cold-formed steel specification was released in 1996. This kind of steel has a high bearing capacity, which is only 1/3 of the weight of wood compared with the same carrying capacity of wood. The surface is galvanized and the durability can reach 75 years without major overhaul. In Australia, about $ 600 million of light steel keel detached houses are built each year, amounting to 120,000, accounting for about 24% of Australia's total construction output. Light steel construction is the fastest growing in the United States, with prefab light steel structure construction accounting for only 15% of the construction market in the United States in 1965; 53% in 1990, up from 68% in 1993 and up to 75% in 2000. The standardization and serialization of residential components and ceramics, as well as their specialization, commercialization and socialization have reached a high level of almost 100%. The leasing of various construction machinery, equipment, and instruments is well developed and the degree of commercialization reaches 40 In the United States, the number of houses built using this system has soared from 55,000 in the mid-1990s to as many as 325,000 in 20003. 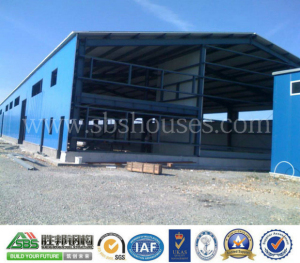 This lightweight steel structure building has become the dominant architectural form in developed countries. Due to its own structural factors (both in theory and in practice), this kind of structural system is only suitable for residential construction below 5-6 storeys. However, due to the restriction of land supply and steel structure supplier price factors in large and medium-sized cities, Multi-storey residential construction is not the most ideal ratio of input-output, in fact, multi-storey residential buildings are generally built in the appropriate price of land and urban areas with a combination of small or medium-sized cities, and its industrialization and cost (Jian'an construction cost 2500 yuan / m2), which adds considerable difficulty to the project in that area. Lastly, the issue of market price is that the housing price in the urban-rural integration area or small and medium-sized cities is appropriate, and the cost of construction is greatly increased. Therefore, developers may find it hard to accept this.